With thousands of chemicals found in cigarettes, it’s no surprise that smoking can seriously harm your health. Most of us are aware that smoking can cause overall health consequences such as lung disease and cancer, but we often overlook the consequences it can cause your oral health. In fact, smoking has been strongly linked to gum disease and tooth loss. With more than 16 million people living with a smoking-related illness in the United States, according to the CDC, it’s obvious why we tell our patients to quit this bad habit. If the overall health risks aren’t enough to convince you to quit smoking, consider your smile. Dr. Edward Gottesman of PerioNYC explains more about the impact of smoking for your smile and how recent studies have found that it can actually alter the mouth microbiota. Bad Breath: “Smoker’s breath” is a notorious side effect of smoking cigarettes. Halitosis, or chronic bad breath, is commonly associated with smoking cigarettes because smoking leads to dry mouth and can allow nicotine to settle in your mouth. Tooth Stains: Smokers can also experience stains from smoking cigarettes because of the nicotine and tar found in tobacco. Tar is a dark residue that can impact the brightness of your smile while nicotine is colorless until it combines with oxygen molecules. Gum Disease: Smoking cigarettes inhibits the blood flow to the gums, which affects their ability to resist infection. Research has shown that smokers are twice as likely to develop gum disease compared to non-smokers. Tooth Decay: Smoking is also associated with tooth decay because the chemicals from smoke will combine with bacteria to create a dangerous combination. Nicotine from smoking also affects saliva, which is instrumental for washing away food particles and plaque. Smoking affects your oral health in so many ways because it actually has a significant impact on the mouth’s microbiome. A new study published in the International Society for Microbial Ecology Journal sound that smoking changes the microbiome in the mouth. The study, which came from New York University Langone Medical Center and its Laura and Isaac Perlmutter Cancer Center, investigated how smoking can change the composition of oral microbiota. Researchers examined mouthwash samples from 1,204 adults who are a part of a cancer risk study. The samples came from 112 smokers, 521 individuals with no history of smoking, and 571 people who had quit smoking. Researchers used genetic tests and data to look through the bacteria in the mouths of volunteers and found that the oral microbiome of smokers differed significantly from non-smokers. The study found higher levels of 150 bacterial species in addition to lower levels of 70 other bacterial species. Smokers were found to have a significantly lower proteobacteria, which is important for breaking down chemicals introduced by smoking. Smokers also has higher levels of Streptococcus, which is associated with tooth decay. 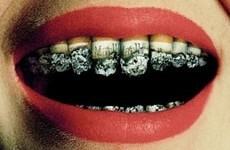 Save Your Smile: Quit Smoking! Although this study found what we already suspected in regards to damaged oral health, researchers also found that there was no difference between individuals who had never smoked and those who had quit smoking within the past 10 years. What can we conclude from this finding? That the microbial balance can return to normal after you stop smoking! We encourage our patients to stop smoking as soon as possible to minimize the damage that can occur to their smile. Gum health, in particular, can take a big hit due to smoking. If you have more specific concerns about your periodontal health, contact our office today! Quitting Smoking with Chantix? Don’t forget to tell your dental provider! This entry was posted in Blogs, Oral Health, Smoking. Bookmark the permalink.